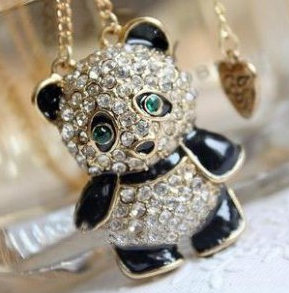 Panda Rhinestone Necklace Only $2.95 PLUS FREE Shipping! You are here: Home / Great Deals / Amazon Deals / Panda Rhinestone Necklace Only $2.95 PLUS FREE Shipping! I love this cute little necklace. Isn’t it great?! I think it would be perfect for a tween you know! My 11 year old daughter loves pandas so I may just pick one of these up for her! Get this Panda Rhinestone Necklace for Only $2.95 PLUS FREE Shipping!